We are manufacturing and supplying a qualitative assortment of frozen vegetables plants (IQF plant) that is designed to hygienically treat and pack fruits and vegetables in frozen form. Widely utilized by our clients from the food and beverages industries, these plants are subject to turnkey as per the requirements of our clients. The vegetables are to be fed uniformly in the feed hopper of the machine. The peeling takes place due to contact of the vegetables with the rollers. 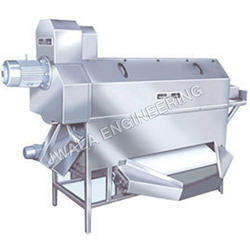 The rollers are covered with abrasive material for effective peeling. The vegetables move forward at a controlled pace due to the screw. The peeling time can be varied by changing the speed of rotation of the screw through the control panel. Water is sprayed from the top during the forward movement of the vegetables. After peeling the vegetables are discharged from the other end through the discharge hopper. The pea pods are fed in the machine. Due to beating action of the blades the grains are removed from the pods. The pea grains fall through the perforated sheet of the drum on to the apron conveyor. The apron conveyor being inclined, the pea grains slide down and some peels and pea pods stick on the belt of the apron conveyor. They are collected on separate chutes on the reverse side of the apron conveyor. Rotor with SS blades mounted on it. Blades are adjustable for angle and height. Support structure for smooth movement of drum consisting of adjustable rollers, SS frame for mounting rollers at both ends etc. 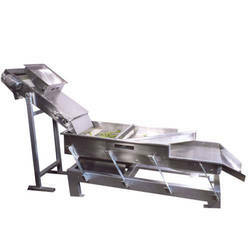 Apron conveyor consisting of SS rollers, SS body, SS mounting frame, PVC food grade belt, support structure for the belt etc. Separate drive arrangements for rotor, drum and apron conveyor. Drive arrangement consists of geared motor, sprockets, chain etc. 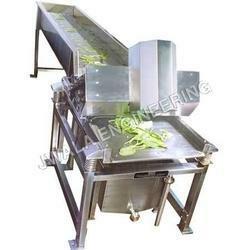 Vegetable Washeris manufactured and ddesigned by our skille dprofessional, widely used for various fruits like mango, guava, apple and vegetables like potato, carrot, cucumber, beetroot, peas etc. 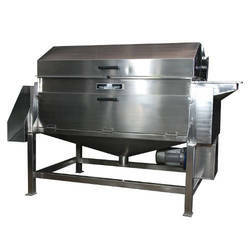 Complete stainless steel body and supports. Suitable drive system including geared motor, sprockets, chain etc. The pea grains along with pods and peels are fed on the vibratory conveyor. The whole pods are separated in the top sieve and less than 5 mm grains are separated from the bottom sieve during the travel of the product on the conveyor. 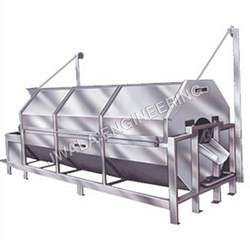 A small belt conveyor is provided to separate the small peels from the grains. Body made of SS sheets. There are two screens fitted on the body. The top screen separates the pods from the grains. The middle screen separates the proper size of the grains from the small size ones to be discarded. APPLICATION:Suitable for removing the excess water from the vegetables before feeding the same to the IQF.